Whose responsibility is it to manage AU GST? Envato is responsible for determining, collecting and remitting GST for all Envato Market purchases from Australian customers. The AU GST obligation is borne by Envato, you have no further responsibility to deal with AU GST on sales made through Envato Market. 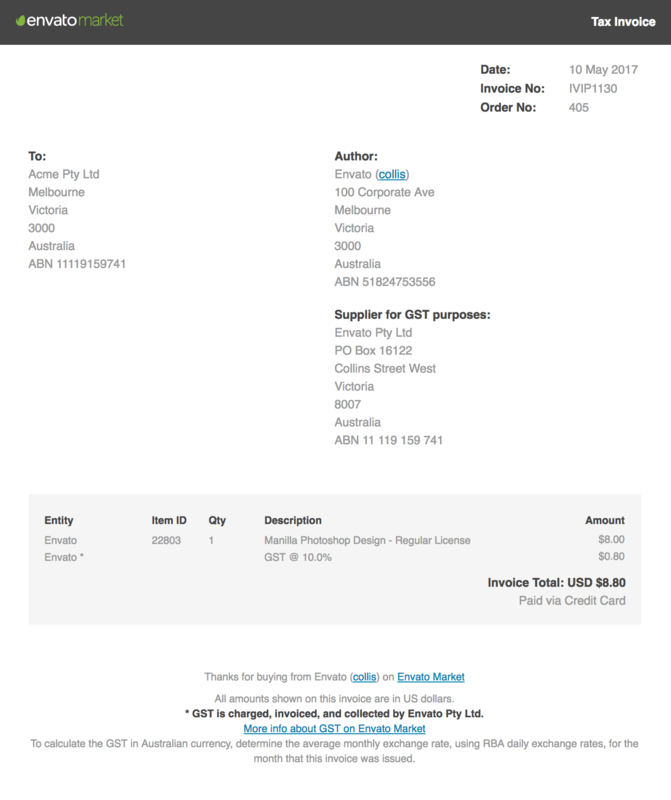 Envato will remit AU GST collected to the Australian Tax Office. As of July 1st, 2017, the seller’s location does not make a difference, Envato is accounting for GST on all sales into Australian buyers. Do you have an example of how it works? AU GST is added to the list price for purchases by all Australian customers. The item price (the amount the author receives) will remain unchanged. Moreover, the GST won’t appear on your statement as it’s not the author’s responsibility or liability. From July 1st 2017, Envato shall start collecting and remitting GST for service fees charged by Envato (Australian Entity). For business sellers, to ensure that your Australian Business Number (ABN) is added to your service fee invoice, add the ABN for your business using the billing information form on your profile. Note that after a tax form has been submitted, that all billing information, except ABN cannot be modified. Use this form to update your ABN. The tax invoices provided may be used for the purpose of claiming input tax credits that an Australian Author may be entitled to. Note that the amounts shown on all invoices and adjustment notes are in US dollars. To calculate the GST paid on an invoice in Australian Dollars, use the average monthly exchange rate for the month that the invoice or adjustment note was issued. The Reserve Bank of Australia provide only daily figures (http://www.rba.gov.au/statistics/historical-data.html) which can be used as the basis for these calculations, however, the published monthly exchange rate for a financial institution may also be used (https://www.westpac.com.au). 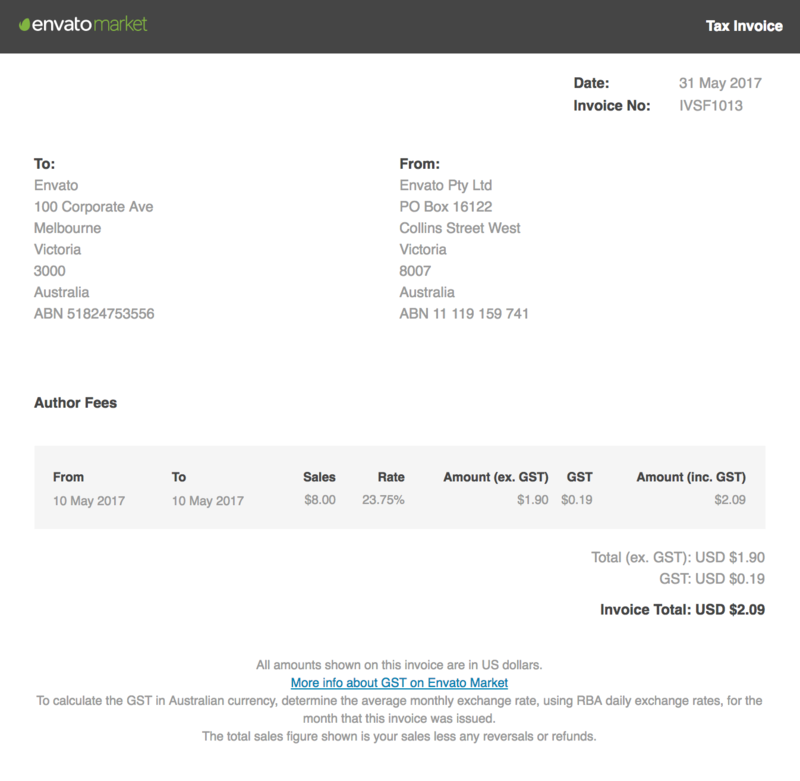 Do I need to pay taxes on my Envato Market earnings?